Posted: Mon Mar 22, 2010 8:45 am Post subject: Re: Need different version. Problems I ran into using the guide. The USB drive being 4GB was to big. I bought a 2GB drive for $10 and it worked fine. Between 512MB-2GB works best. The Operating system would get to 99% install completion and get an error. To solve this I got an older version which you can get here. http://h20000.www2.hp.com/bizsupport/TechSupport/SoftwareDescription.jsp?lang=en&cc=US&swItem=PSG_I22056-106343&prodTypeId=12454&prodSeriesId=339208 . The newest version of TeamViewer didn't install correctly. To solve this I downloaded the older 3.6 version(works on XPe and Windows 7 just fine). You can get that here. http://www.teamviewer.com/download/version_3x/TeamViewer_Setup.exe . After all that though it's now up and running and remotely I might add which is very nice. Thanks jeepsterguy and VaHam. Although It might not have worked right away you certainly pointed me in all the right directions. Hope this solves some problems and headaches for those future people reading this. Glad you got it working. You'll love the MJ on the TC! I just setup a 5710 256/256 without too much difficulty thanks to this guide. A few things are outdated on this guide so I thought I would add a few comments. I didn't bother resizing the Ram disk to 64mb and everything worked fine. - 2 of the Altiris removal scipts are no longer available, (.NET and Multiple Components) I used the 4 that remain as well as Sygate security removal. I downloaded the scripts onto a USB key and just double clicked the file. After that navigate to the C:\Program Files\Altiris\eXpress\Deployment Server\RIP's. Double click the file and it will do it's job. A couple of times it looked like nothing was happening or things had frozen up but be patient, it worked great. When I started with the fresh install of XPe, disk usage was at 224mb, after the removal scripts I had 182mb used. The other thing I did was go into device manage and right click on each USB port plus the Network Adapter and went into power management and unchecked the box to be sure my USB ports would never power down. I also went into the perfomance section and clicked "Adjust visual effects for best performance"
After a commit and restart I plugged in the magicjack, it was plug and play, no tinkering required. Only 13mb remaining on the Flash Drive. Remote desktop didn't work, it killed the audio. Teamviewer wasn't an option, it wouldn't install, multiple errors and at one point said it needed 18mb, I only had 13 available. TightVNC was the winner. Easy to install. During the install process you can choose to have it run as a service and can also deselect unneeded components. Deselect VNC viewer and Documents, you only need VNC server. It only used about 1mb of space and took less than 5 minutes to have up and running. I have a cordless with 3 handsets plus a corded phone plugged into the magicjack. All phones ring, call quality is crystal clear. The 5710 800mhz 256/256 is definitely sufficient for magicjack. Worked very well here on a Hp t5710. I have 280mb left on the C volume. Remote desktop did the same for me. I used Team Viewer and found that TightVNC worked much better. Team Viewer worked but it was very slow. TightVNC worked much faster. It's a smaller program that uses less computer resources and doesn't have those annoying messages while having all the features Team Viewer has. Like johnvan said only install the TightVNC server onto the Thin Client. Then install only the TightVNC viewer onto your main PC. You also want to add the TightVNC server to your Thin Client's start up programs. Here's a very small program (Only 76Kb) that you can use to do so. Get the Standalone.EXE version and extract it. Run the program and click the HKCU / Run tab at the top. Then right click in the window and select new. Locate the TightVNC server.exe. Then make sure the check box next to it is selected and close the program. Now you have made sure that TightVNC will run when your Thin Client starts in case of power outages or you want to restart it periodically. I went into the Program Files and deleted the Windows Media Player and the MSN messenger folders as well. Both programs are unneeded. If you do the same you can go ahead and delete the MSN messenger from your start up programs and delete all the shortcuts for both the Messenger and Media Player in the Start Menu. Remember EWF configuration must be turned OFF for your settings to stay changed. You can make your Thin Client run smoother if you go to your Control Panel -> System-> Advanced Tab-> Performance Settings-> Then click Adjust for best performance. This will use less resources and change the look from XP to a more efficient Classic Windows look. I have tightvnc as a start up program but I did it differently. I think I chose run as a service during the install and that was all that was required. I do regular scheduled restarts and it always starts automatically. Posted: Sat Apr 30, 2011 12:19 am Post subject: Target Disk is too small! First of all, thank you for such a detailed post! I made it to the "Install XPe" step. When I booted my TC5700 (with 512MB RAM) from my flash drive, and attempted to install the image, I received an error stating "*** ERROR *** The target disk is too small!" BIOS reports IDE Primary Master: 192MB ATA Flash. The flash drive in your machine is too small and needs to be replaced by a 512MB or 1 GB module. The first sticky or two in this forum explains the details. 1) After plugging the MagicJack into the T5700, I had the TigerJet driver error (shown in Device Manager). I installed the driver using the steps listed earlier in this post (thank you, by the way) and rebooted. That solved the driver issue. 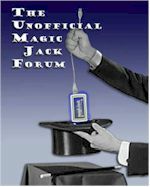 2) I then installed my MagicJack onto a different Windows XP machine and copied the MagicJack installation folder (i.e. C:\Documents and Settings\UserXYZ\mjusbsp folder) to a Flash Drive (70MB is large enough ... I tossed a cheap 1GB flash drive at it) and inserted the Flash Drive into the T5700 (permanently). 3) I added magicjack.exe (from the mjusbsp folder) to the machine's startup folder and everything works great. I can power up the T5700 and make / receive phone calls via the MagicJack. I did all of this with the default XP image that came with the T5700 (i.e. no re-imaging required). I'm glad you were able to make it work for you. Keep an eye on your free space on the flash drive. Things tend to get unstable if it drops below 15 MB or so. And if MJ ever does an upgrade that requires more than the amount of free space you have then you may face problems again. Posted: Wed Apr 10, 2013 5:04 pm Post subject: A mechanical KVM switch will likely disable the MJ. I bought a cheap KVM switch to switch between the TC and my old desktop it is sitting beside. It works OK and frees up a USB slot to boot. Just an idea for you guys. If your MJ Plus is connected to one of your computers (rather than powered by the wall plug adaptor), a mechanical KVM switch will likely disable the MJ, because the MJ does not like you disconnecting and reconnecting your keyboard. I learned the hard way, and MJ techs say their is no solution. I'm only dealing with restarting the MJ every time while I wait for my replacement power adaptor. Unfortunately, while I'm on my non MJ computer... the MJ is out of commission because the KVM has shut it down! I wonder if its just related to the plus. I have run my Regular MJ this way for over 3yrs and have never had a problem.